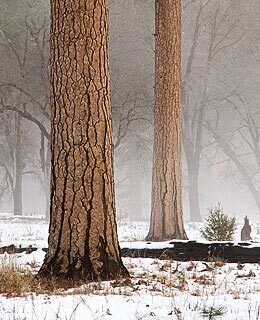 Monday Blog Blog: Greg Russell, Ph.D.
Pines, Fog, Yosemite Valley, Yosemite National Park, California, 2009 by Greg Russell. When I first started Landscape Photography Blogger, many generous photographers and other visitors commented on the blog posts I wrote, but rarely on the blog posts written by Dad that I republished from magazines, newspapers, travel logs, field notes and Dad’s books. For some time, blog posts by my father, though they enjoyed more traffic, did not receive as many comments. Now that has changed. 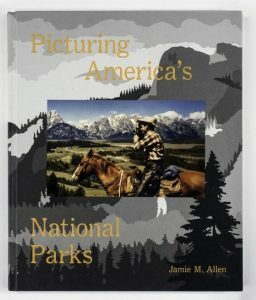 One day a young man came by and made a comment on Dad’s front notes I had re-published here from my father’s book Navajo Wildlands: As Long As The Rivers Shall Run in the ground-breaking Sierra Club Books Exhibit Format Series. The series of three blog posts named after Dad’s piece starting with, “Toward A Sense Of Place 1” is especially poignant and illustrative of Dad’s philosophy with which I was lucky enough to grow up. The young man, Greg Russell, also made a comment on my “About The Blog Author” page. His comments were insightful and showed that he himself had a strong conviction about wilderness and a profound connection to the land. I was impressed and I went to Greg Russell’s blog, Alpenglow Images, to take a look at his photographs. His images were beautiful, many of them perhaps a bit too much so in that they looked to me to be similar to a lot of other work I had seen. He had a slightly different twist on “Mesa Arch” in Canyonlands and on the sand dunes in Death Valley, some waterfalls, some sunsets. Regardless, he and I struck up an online friendship based on his excellent comments that make a consistent contribution on this blog. Photography can in some ways be rife with elitism. Some photographers are the most generous and helpful people you will ever meet. Some are arrogant, cliquish and exclusionary to outsiders. One time I heard the story of an aspiring landscape photographer having a friendly talk with another landscape photographer. The veteran photographer, who claimed to be well-known (I’ve never heard of him) as soon as he found out the newbie made his living from another source other than photography, practically ended the conversation in mid-sentence. This same photographer had gone on and on about how he had first made the plunge into being a full-time photographer. Eventually the listener to these great tales of heroism asked, “Well, how did you do it? What did you actually do to bring in the bacon while you were getting started?” It turns out the arrogant photographer confided that his wife had a rather large trust fund. This is the classic story. Many, many people, more and more all the time, buy their way into being full-time in photography, rather than beginning part-time and working on a shoestring. Yet those who already have their place successfully bought and paid for, have the audacity to look down on those who are still learning. Wait a minute, I thought that was everybody? I guess not. Some people know it all already. Greg Russell started part-time and built up his photography the old-fashioned way. It started as a hobby and progressed to what his wife Stephanie now calls, “A serious addiction.” Should we all hold hands and look down on Greg Russell because he is part-time? It would be a grave error to do so. Out of all photography blogs I have yet seen, he is the one whose work has most improved over the year that I have observed his photography. His voice and vision are starting to shine and he has a strong one of each, I assure you. In case you may imagine that his only talent is photography, he also has a family: his wife and a boy of three so far. Besides making photographs, helping with the kid, blogging and processing photographs, he also is completely inundated each evening with tests and papers to grade, lectures to plan, and papers he is working to get published. Greg Russell in his other life has a Ph.D. in Biology with an emphasis in Animal Physiology. He teaches at Orange Coast College in Costa Mesa, Orange County, California. He lives in Riverside. If you know the area, you know that is a bear of a commute too. He also happens to be the director of the Plastination Lab on campus. “Plasti-what?” You say. Plastination is the process of preserving animal creatures or part of them in plastic for further study, research and teaching. He plastinated a group of brains, no joke, for the Arizona Science Center in Phoenix. For that display his lab embalmed, dehydrated in acetone and permeated with polymer, a fancy way of saying they petrified the stuff with plastic, a brain from a monkey, a rat, a sheep, a cat and a rattlesnake, whose brain is only the size of a fingernail. So when they say that rattlesnakes don’t bite lawyers out of professional courtesy, it truly is an insulting joke. I guess there is no joke for full-time photographers who look down on part-time photographers. Maybe their brains have already been through Greg’s lab. Greg Russell, Ph.D. and his lab also not long ago plastinated a five foot long Humboldt Squid, one of only a few others in the world. These are both beautiful photographs. I like the subtle pinks, blues and purples. I had an interesting conversation the other day with Gary Crabbe about photographer influences, “magic hour” and alpenglow. As you may know, he started as a photographer working for Galen Rowell. Anyway, I wrote a comment that I thought might offend him. 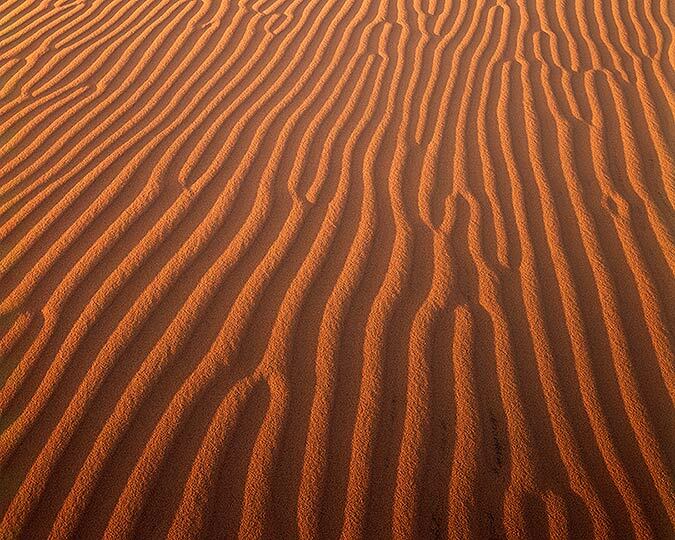 I said that I thought his sunset images were more profitable than of high quality like his other photographs. He is a very nice guy and a long-time professional photographer. Apparently he was not offended at all. 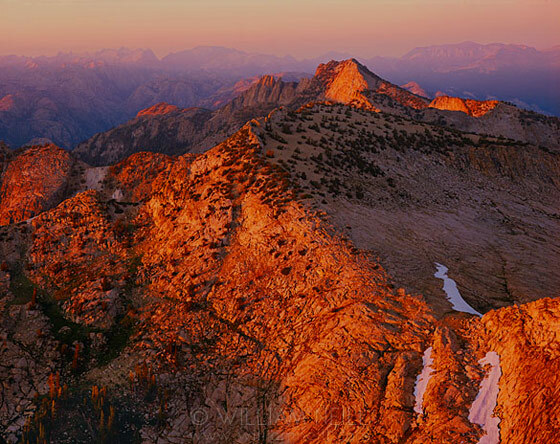 He did make an excellent point in defense of photographs of Sierra and other mountain alpenglow with just the tips lit up, reminiscent of Galen Rowell’s work. He said that many people became photographers because of Sierra sunsets and sunrises. He also said that while they had been done before, many photographs of high mountain lakes with peaks reflected cause him to feel nostalgic about some of the best memories in his life of being in the high Sierra. How could I disagree either with the logic or with the argument put across with such a winning charm and kind voice? I couldn’t and I can’t because some of my best memories of my life are of mountain sunsets and sunrises when I think about it. So you keep on doing your mountain alpenglow. I no longer consider myself a detractor, especially since I see in much of your later imagery a solid attempt and success at capturing something a bit different and unique. Try to keep doing that too. Best wishes my friend. Keep your ears tuned and eyes peeled for Greg Russell’s new blog posts. He will probably tell you more about why he called it Alpenglow Images himself. To get you started on Greg’s philosophy, read about his interesting process of how he re-designed his artists statement in his post, “(Re) Alignment,” or read his artists statement itself. For a more complete idea on his approach to photographing wilderness, see his blog post right here on Landscape Photography Blogger, “Moving Past The Repertoire.” Any of his material will drive you on in your own quest for affinity with nature and for the quintessential landscape photograph. Happy trails. 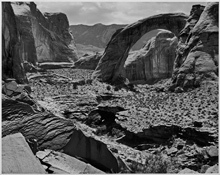 “Rainbow Bridge From The Upstream Side, Now Rainbow Bridge National Monument, Utah, 1965” FROM the Sierra Club Exhibit Format Series book, “Navajo Wildlands: As Long As The Rivers Shall Run” by Stephen C. Jett and Philip Hyde. 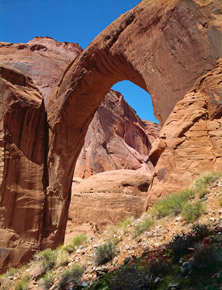 Rainbow Bridge From The Upstream Side, Now Rainbow Bridge National Monument, Utah, (Color) 1965 by Philip Hyde. It was the end of November and the Northern Sierra Nevada winter set in. Long cold rains, sleet and snow alternated with ever lower night temperatures when the weather cleared. The telephone rang, Ardis Hyde answered. She set the receiver on the desk, walked out the back door and looked up to where Philip Hyde was hurriedly putting a roof on his new studio addition on a precious day of dry weather. “Tell him I’ll call back a little later,” Philip Hyde yelled back. “OK, tell him I’m coming,” Philip Hyde replied. He climbed down the ladder and came to the phone. David Brower told him there was not much time. 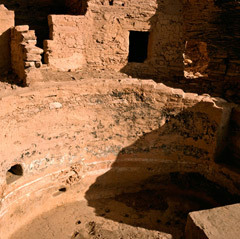 There were urgent threats to the Navajo lands in Northeastern Arizona. 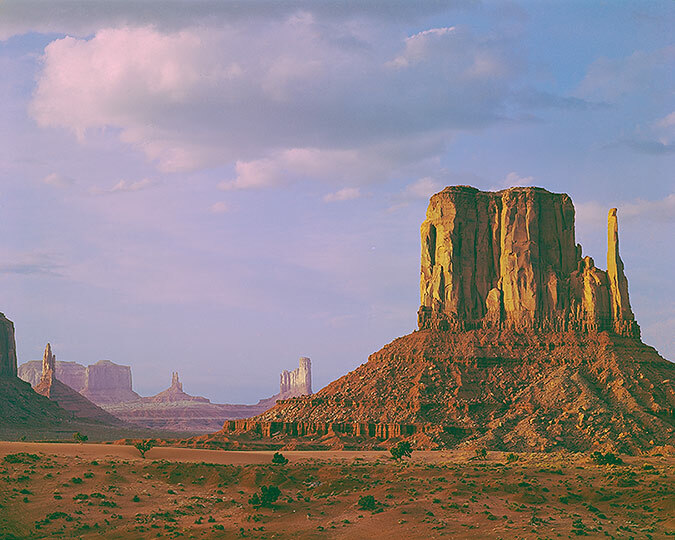 Proposed dams on the rivers, Uranium and mineral strip mining, oil drilling, and civilization’s encroachment on the Navajo way of life were just a few of the dangers to the desert landscapes that the Navajo had called home for a thousand years undisturbed. Philip Hyde gathered several layers of thick tarps and plywood, put them over the roof skeleton of his newly framed studio and in less than a week he and Ardis Hyde were off to Navajo Country in Arizona. He would take his chances with putting on the roof. Hopefully the heavy snows would hold off until he returned. Hopefully there would be enough clear weather to finish the roof before too many January snows made it impossible until Spring and a whole season was lost. By December 8, 1964 Ardis and Philip Hyde were on the road and by nightfall December 9 they arrived in Gallup, New Mexico near the Arizona border and the Navajo Reservation. Fortunately they did not camp out but stayed in the Ramada Inn because the low that night was 12 degrees Fahrenheit. Early the next day they drove out to catch the morning light on Window Rock. The Navajo Tribal Council was in session. The Hydes met with Navajo Tribal Council Representative Sam Day. Ardis Hyde wrote in the Travel Log, “We had a brief but illuminating talk about what we should see in the way of tribal parks present and proposed…. He is recording chants and rituals in the evenings.” Ardis and Philip Hyde visited the Good Shepherd Mission and a few trading posts. They bought a beautiful 4’X6’ Navajo rug for $22. They spent the night in Chinle at Thunderbird Ranch in a new unit for $9.00. Because the dining room was closed, Ardis Hyde cooked soup and coffee on the SVEA portable stove in place of room service. In the morning they went to the new Navajo visitor’s center to meet with the liaison officer between the Bureau of Indian Affairs and the Navajo Indian Tribe for more guidance on what landscapes to photograph. They also bought several reports on Navajo planning and affairs. Philip Hyde photographed Ship Rock and other landmarks, some that had never been photographed before. By Monday, December 14, temperatures were down to 3 degrees Fahrenheit and it was hard to photograph. The next day the sun warmed the air enough to make photography easier. A Navajo guide showed the visitors into Monument Valley where Philip Hyde made two exposures that later became well-known landscape photographs, “Evening Light On West Mitten Butte” and “Anasazi Bighorn Sheep Petroglyphs” on the wall that Ansel Adams made a photograph at a different angle. 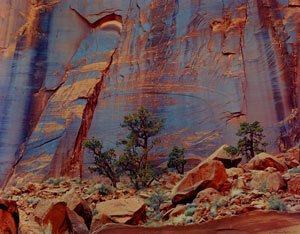 In the days to follow they traveled on to Batatakin Ruin, Muley Point, the Grand Canyon and finally Canyon de Chelly. For more on these Navajo adventures see the blog posts, “Toward a Sense of Place 1” and “Toward a Sense of Place 2” by Philip Hyde. Many fine photographs went home in the 4X5 and 5X7 view camera film holders. Yet the Hydes found they had barely touched what the country had to offer. That night they camped under the Cottonwoods and stars after threat of rain had passed. ‘Sheep’ frogs made a “chorus at assorted pitches of bleating.” The Hydes could see the glow of a beautiful sunset on all of the high domes across the landscape but they nestled into their “shady enclosure with the smell of a Hopi wood fire and snug beds after a nine mile day.” The next day they hiked on in the canyon bottom slowly picking their way and “stumbling over streambed rocks most of the time.” It heated up. They saw a few pools of clear water to swim in but decided to wait until they reached Aztec Creek. However, Aztec Creek turned out to be brown with the recent storm. They climbed out of the canyon up onto the “Slickrock domes” for views of the mountains and surrounding landscape. Then back down to hot chocolate and another early bedtime. The next day as they entered Bridge Canyon they came to very clear water under cottonwoods, dense foliage and three horses grazing on wild flowers. Bridge Canyon was beautiful with dense foliage and high vertical walls until the last mile before Rainbow Bridge when an inner gorge develops out of darker red sandstone in layers. Here the trail continues above a ledge and we look down into the gorge to see the stream. We pass many tempting pools and catch our first glimpse of Rainbow Bridge about 10:30 am, unfortunately in flat light. From this upstream approach Rainbow Bridge appeared finer, not as massive as from below. At the last turn above Rainbow Bridge we hear voices. We coincided with a boating group coming in. They were immaculately dressed in white and light-colored pressed clothes. There were two families of shrill children. Philip took some photographs of Rainbow Bridge from the west side on a ledge above the stream and we hurried away to each lunch in quiet upstream. Philip bathed in two pools. There were frequent overhangs with seeps apparent. At one of these we found enough water to fill our cups. Saw a bee collecting pollen and at another seep we saw a ‘Sheep’ frog up close. He had no webbed toes, a gray-black back and orange-cream sides. We heard an occasional canyon wren call. I spotted some kind of flycatcher with rufous tail, white side feathers and a horse, gargling call. The trail through Redbud pass was all in the shade. We paused to admire a butterfly with a Navajo rug design and vegetable dye colors gaining strength in his wings after emerging from his chrysalis. Our first view of Rainbow Bridge had been some years before, after coming up five miles from the river through a magnificent canyon of beautiful rock sculpture and delightful long, narrow pools. We were almost reluctant to go to Rainbow Bridge again after that fine, wild memory of it, knowing that it was now only a mile and a half from the rising edge of Lake Powell that is engulfing the stream that created the bridge. We had been three days in the wilderness, with all that is implied in getting close to the land and letting it get close to you. We rounded the last great curve above Rainbow Bridge and began to see tourists. I sniffed the air and—sensed something extraordinary about it… perfume, emanating from some immaculately clad yachtsmen—or was it the yachtwomen among them—busily signing the register under the Bridge. The Bridge looked the same, or did it? Was it only an illusion that it looked… a little plastic? To know what the real Bridge looks like, don’t you have to participate in the finding of it, a little arduously along the stream that made it possible, the heat and the cobbles and the water and the time that all combined to build that Bridge? 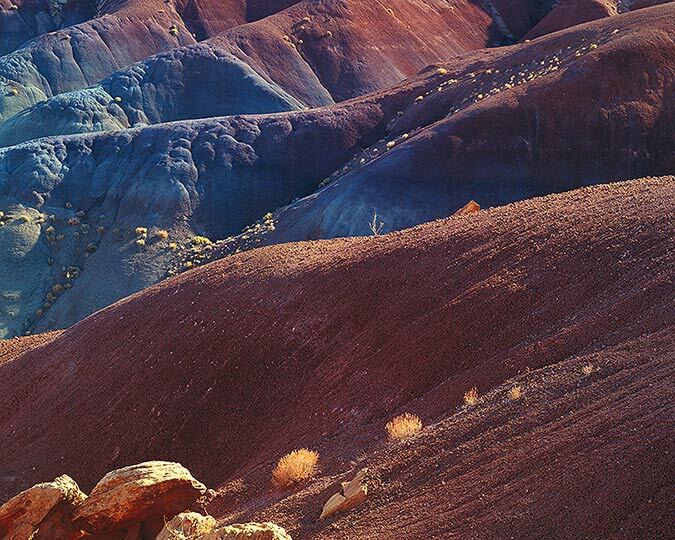 I think of the land of the Navajos as a living entity of moods—of light moments and gloomy. Above all I think of color—color constantly changing with the light, color that infused the life of the people who have passed over this land. Overpoweringly, this place testifies to man’s transitory nature—and yet confirms his continuity. That continuity may end if this should ever cease to be a land of time enough and room enough. For sizes, pricing and more information, see the blog post, “Limited Edition New Release: Rainbow Bridge From The Upstream Side (Color)” on Fine Art Collector’s Resource Blog. 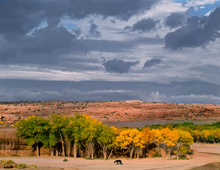 Horse and Cottonwoods at the Mouth of Canyon de Chelly, Canyon de Chelly National Monument, Arizona, 1963, by Philip Hyde. From Navajo Wildlands, Sierra Club Books. Our Navajo Mountain adventure took on a new aspect two mornings later when our packer brought up his retinue of three horses, four people, and two dogs. Walking down into Painted Rock, where we would set up our base camp for exploring the westside canyons, we learned that the first four miles don’t prepare you for the spectacular climax. The trail traverses the slopes of the mountain—lightly dusted with snow on that early morning—crosses several incipient canyons, climbs a bit, and passes through a narrow sandstone defile called Sunset Pass on one side and Yabut on the other. Then the trail peels off like a dive bomber into a funnel-shaped abyss, Cliff Canyon, and its great sheer cliffs of warm yellow sandstone. The canyons that twist their way eventually into the waters of Lake Powell come into view, and the long backbone of the Kaiparowits Plateau recedes in a straight line northwestward into the blue slopes where the Escalante River begins.The isolated bulk of Cummings Mesa intervenes to the south. If you look when you are high enough, and it is a clear day, you will see the great arch of the Kaibab Plateau on the far southwestern horizon. We saw it. To the north, Waterpocket Fold, and its Circle Cliffs are partly cut off by the northwestern shoulder of Navajo Mountain. Within this arc you see what is left of the climax of the Glen Canyon system. They still have beauty, but to those of us who knew Glen before it was flooded this remains a supreme act of bureaucratic vandalism. Happily, little of the unnaturally—and temporarily—blue water of “Lake” Powell is visible from the trail. Two miles beyond the great drop into Cliff Canyon is First Water. A mile beyond that, our trail turned out of Cliff Canyon to climb through a narrow cleft in the sandstone, Redbud Pass. At this turn, we saw the pictographs that gave Painted Rock its name. 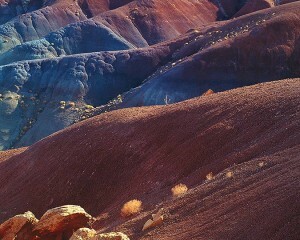 We camped, and spent one day exploring Cliff Canyon and Forbidden Canyon. The second we went as far as Oak Canyon on the trail leading around the Mountain. On the third day we reached around the Mountain. On the third day we reached the perigee of our five-day orbit when we decided to walk down to Rainbow Bridge. Rainbow Bridge from Downstream, Navajo Mountain in the Distance, Rainbow Bridge National Monument, Arizona, 1964, by Philip Hyde. Before Glen Canyon Dam filled and Lake Powell flooded Forbidden Canyon. Reached Hiking with a Backpack. Our first view of the Bridge had been some years before, after coming up five miles from the river through a magnificent canyon of beautiful rock sculpture and delightful long, narrow pools. We were almost reluctant to go to the Bridge again after that fine, wild memory of it, knowing that it was now only a mile and a half from the rising edge of Lake Powell that is engulfing the stream that created the bridge. I think of the land of the Navajos as a living entity of moods—of light moments and gloomy. Above all I think of color—color constantly changing with the light, color that infused the life of the people who have passed over this land. Overpoweringly, this place testifies to man’s transitory nature—and yet confirms his continuity. That continuity may end if this should ever cease to be a land of time enough and room enough. The automobile could obliterate both, and along with them, the wilderness experience. I still remember the climax of that experience for us. It was the walk to Keet Seel, and what we felt there. 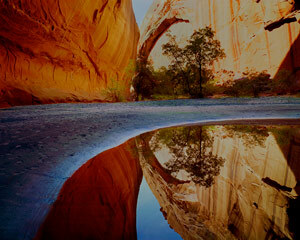 Keet Seel, the most remote of the three great Anasazi ruins in Navajo National Monument, is about eight miles by trail through the sandy canyons of the Tsegi system cut into the mesas just west of Monument Valley. The great ruin itself is not visible until the last quarter of a mile, and then it seems diminutive. Not until you are under the edge of the great sandstone shell sheltering the ruin does its scale become apparent. Great Kiva, Mummy Cave Ruin, Canyon del Muerto, Canyon de Chelly National Monument, Arizona, by Philip Hyde. We climbed up the ledge, into the ruin, and suddenly believed we were the discoverers. 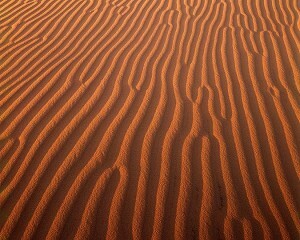 There were few footprints, and we saw only a lone Navajo looking for strays. The silence was so pervasive that we found ourselves speaking in low tones—I guess out of respect for the people who had just departed 700 years ago. The wind blew everywhere we went that spring, but it was still now. The silence grew as we cooked supper and rolled out our bags on a lower level beneath the ruin. A tiny seep, with a depression beneath it just big enough for a cup, gave us our nightcap, and we went to sleep where the ancient ones had gathered food and looked out and talked, and had put their children to sleep.